Book Reveals: The simple steps to design and implement your own PMO in 4 weeks! All of the information you need presented in a simple, easy to follow format. No need to spend weeks ot months working out what you need to do. You really can start building your PMO today! Enables you quickly to gain the knowledge you need in a fraction of the time. Leaving you confident in what you need to do! This guide means you will not waste time trying to work out what needs to be done or have to employ expensive consultants to provide the answer. 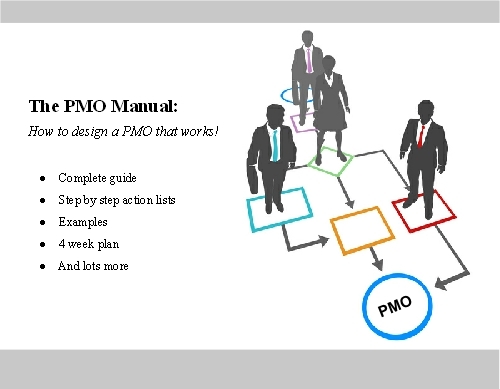 This provides you with the information you need to set up a PMO quickly, starting today! ....although I have read many other books (in English, Czech and Polish - thus from various sources and with different approaches), I am sure this one ranks among the best. It is concise, clear cut, comprehensive, practical and really helpful. Your own "secret PMO manual"
220 pages packed with all of the information you need to design and implement a real world PMO. Split into 3 sections and 25 chapters. It really is your very own “secret PMO playbook”! Each of the chapters contains a summary action checklist so you know you are completing the right steps! This takes away the guess work. Simple 4 week plan that tells you what to do each week to set-up your PMO. Chapter 2: What is a PMO? I am confident that the PMO Book will provide you with the information you need that, if for any reason you are not completely satisfied with the PMO Book, contact me with the first 30 days and I will provide you with a full refund.